Last week saw the introduction to the Tinsman Division, one of the competition’s most storied. It was from here that the winner of the very first competition came, when Eldrazi Arisen overcame tremendous odds by beating a Duel Deck, a Planechase Deck, and a Duels of the Planeswalkers deck before claiming victory from its setmate Invading Spawn in the final. In subsequent seasons it has seen success elude it, though it did claim Rosewater Conference honours in the 2010/2011 season as Doom Inevitable completed a similarly unlikely run before falling in the Finals to Elspeth. This time, fans of the mighty Tinsman can hope that one of the final four decks to survive the first cut will be the one to bring glory to their house. 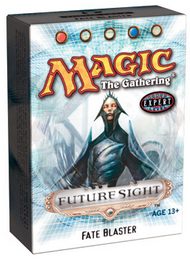 The Future Sight set might well be the one that champions the Tinsman to victory. With none in the Nagle Division, this is the first time we’ve seen them in action. Fate Blaster and Future Shock decks haven’t disappointed, moving to the next round over the backs of decks from Coldsnap and Ravnica. Ninth Edition’s Custom Creatures has also continued to impress, delivering a knockout blow to another Coldsnap deck using what is often dismissed as a weak and vulnerable tactic- the employ of creature auras. Rounding out the quartet is Dissension’s Azorius Ascendant, one of the ten guilds of the plane of Ravnica. These four will come together today to determine who will be representing the Tinsman, and will have only the Nagle Divisional winner Endless March standing between it and a shot at the Finals. Let’s head down to the arena! An explosive start from Custom puts its opponent on the back-foot almost right away. It leads with a Norwood Ranger, then adds a Wurm’s Tooth followed by a Blanchwood Armor on the Ranger. Never missing a land drop, it then follows with a Yavimaya Enchantress empowered with a Web. As the beats come battering in, all Future Shock can manage is a trio of Nessian Coursers. Two of them trade out for the Enchantress, but when she is replaced by a Trained Armodon straightaway the game is won. Future Shock never had a chance. With victory in its grasp, Custom Creatures is playing for keeps. It leads with a Norwood Ranger, then gets an Elvish Warrior. It’s a great start, with the promise of more to come, but then it misses its third land drop and struggles to find more Forests. Still, it manages to enchant the Warrior with Treetop Bracers, so it can keep a steady pressure on its opponent. Meanwhile, Future Shock is enjoying the reprieve. An early Edge of Autumn helps it hit its drops after leading with a Thornweald Archer, then it plays a Nessian Courser. Not to be outdone in the aura department, it puts a Flowstone Embrace on the Courser, and begins tacking in for damage. Custom goes thgrough two Rangers to stay aflot, and loses a Trained Armodon to Ghostfire. But at last it lands a third Forest and enchants it with Overgrowth. Once it finds a Blanchwood Armor for the already-emboldened Warrior, the race is on. Down to 4 life, Custom Creatures is the last deck standing. The Azorius begin the game according to plan as they lead with a Beacon Hawk, then follow with a successive pair of Soulsworn Juries. Fate Blaster, meanwhile, is in the unusual position of being the beatdown as it chains two Blind Phantasms and a Dandân. It begins pressing the attack, though the Senate’s Halcyon Glaze gets in a shot before Venser’s Diffusion returns it to hand. It’s followed by a Jury through a Stingscourger. Unfortunately, Fate doesn’t hit a second Mountain for a number of turns, leaving the Riddle of Lightning and Boldwyr Intimidator useless in its hand. Once the Azorius start tapping down with a forecast Plumes of Peace and giving lifelink through Paladin of Prahv in the same manner, the Azorius manage to pull away for good. A Tidewater Minion keeps bashing in, but the final strike comes from the re-cast Halcyon Glaze when a Souldsworn Jury is played. Fate gets off to a stronger start here, with a turn-2 Dandân followed by a Blind Phantasm. The only problem is, the Azorius have only Plains in play (and a hand full of White creatures to boot). This is remedied on turn 4, however, when Fate ambushes the Azorius with a Barbed Shocker, slipping right past its tapped Mistral Charger and freshly-summoned Minister of Impediments. Forced to flush its superb hand, the Azorius are left wrong-footed. Still, they manage to array their defenses quite well, with a Soulsworn Jury, Benevolent Ancestor, the Minister, and the Tidewater Elemental. Fate Blaster gives up attacking, but once it pulls a Vedalken Æthermage, it uses the wizardcycling ability to snare the Magus of the Future. The Magus puts its board into overdrive, given plenty of time and space by the containment-minded Azorius. Another Blind Phantasm, an Aven Augur, a Riddle of Lightning (which whiffs on a land), Stingscourger, and land aplenty flow as a result, with extra card manipulation coming from a Foresee and Mystic Speculation. Against overwhelming card advantage, the Azorius slowly see their secure position eroding across the table. A Fatal Attraction kills the 4/4 Elemental, since the Azorius can’t expose themselves to more damage by using the Benevolent Ancestor to save it each turn. The Minister draws a Spin into Myth, while the Aven Augur and Venser’s Diffusion clear the Azorious board, albeit temporarily. The Azorius only stay upright thanks to a Palliation Accord, but at 3 life when an Emberwilde Augur touches down, their doom closes in. Fate Blaster finds itself in an advantageous position, with two Islands and a Mountain in its opening hand, sitting right next to Magus of the Future. A Sage of Epityr all but assures a turn-5 Magus, and it plays Blind Phantasms on the way there for some early damage. Sadly for the Azorius, they get stuck on two land for a couple turns, finally ending on three. They lead well with a Mistral Charger and Benevolent Ancestor, with a hand full of quality like Plumes of Peace and Sky Hussar. Fate Blaster catches an extraordinary stroke of luck when Riddle of Lightning (targeting its opponent) catches the Boldwyr Intimidator, blasting for 7. The last play of the Azorius is the Stoic Ephemera, and Fate’s creatures simply swarm in for the kill. Custom has a strong start with an opening-turn Llanowar Elves. It follows with a Giant Spider, Trained Armodon, and Kavu Climber, as well as an Overgrowth on a Forest. Fate Blaster, on the other hand, has a bit of a risky keep that pays off as it gets the land it needs. It begins with an Emberwilde Augur and Blind Phantasm, then lands the solidly defensive option of a Cryptic Annelid which helps dredge up the last Island needed for a turn-5 Magus of the Future. That changes the game on its axis as Fate Blaster is able to hit its land drops steadily and consistently. Although the Blind Phantasm is lost in a trade with the Kavu Climber (it gang-blocked next to the Augur), a Shivan Meteor blasts a Craw Wurm to keep the board manageable. In one turn, however, Custom does some pivoting of its own. The Armodon draws a Blanchwood Armor (+5/+5) while the Spider gets a Web. Luckily, Fate had just played a Sage of Epityr so it was able to absorb the Armodon’s surprise strike, then solve it with a Spin into Myth. The board settles in to a protracted détente, with Custom trying to land threats and Fate trying to blunt them. An Emperor Crocodile trades out with a Vedalken Æthermage and Dandân. A Shapeshifter’s Marrow draws a Naturalize. Fate begins going on the offense when it bounces the Spider and swings in with an Aven Augur, beginning Fate’s assault. A Wurm’s Tooth keeps Custom up with life, but the game goes so long that Fate can cast Mystic Speculation several times per turn, rigging the game in its favour. It kills the recast Spider with a Riddle of Lightning after planting a Spin into Myth in its top three cards, and then moves in for the kill when it engineers a Riddle of Lightning/Boldwyr Intimidator combo to smash Custom for 7 to the face. With the board stalled out, the Intimidator makes all the difference and takes the game. Custom’s had enough, and bolts from the opening gate. A turn-1 Llanowar Elves enables a Wurm’s Tooth, Norwood Ranger, and Trained Armodon, the last of which draws a Web. Fate happily topdecks a Sage of Epityr for its opener, followed by a Blind Phantasm, Barbed Shocker, and a very welcome Cryptic Annelid. The Shocker dies when it forces a gang-block with the Llanowar Elves and Norwood Ranger, but unable to make an early breakthrough Fate Blaster starts to bog the board down and kick its scry engine into gear. It soon manages to play the Magus of the Future, and soon follows with the Boldwyr Intimidator. Only this time, Custom doesn’t let itself get intimidated. Instead, it brings out an Emperor Crocodile and Craw Wurm alongside its Giant Spider and Norwood Ranger, and begins whittling down Fate Blaster. Fate knows that it has to keep its Intimidator up, as that’s one of its few ways to reliably win, so it decides that it’s gotten what it needs from the Magus instead. On the next attack, it gang-blocks the Wurm with its Magus and a Blind Phantasm, letting the Crocodile pass unmolested. It then bounces both of Custom’s other creatures with a pair of Venser’s Diffusions, so that when the dust settles the Croc stands alone- and dead. Still, thanks to the early Wurm’s Tooth Custom has life for days, and it immediately plays another Craw Wurm. When it then girds the Wurm with Treetop Bracers, it’s able to turn sideways to strike the finishing blow. Fate Blaster opens its account with an Emberwilde Augur, while next turn sees Custom out with a Yavimaya Enchantress. The Augur gets in a couple hits, but then Custom drops a Blanchwood Armor on the Enchantress, which is suddenly swinging in for 7 damage. This forces Fate to regroup. It passes is turn without incident. Custom taps most of its land to bring out an Overgrowth, pumping the Enchantress, but it gets bounced by a Venser’s Diffusion. This minor setback becomes a major one as Fate then plays and attacks with a Barbed Shocker. Custom is forced to throw away its four-card hand of the Enchantress, an Emperor Crocodile, a Forest, and a Craw Wurm, and draws another four- three auras and a land, with not a creature in sight to play them on. The Augur and Shocker keep Custom wrong-footed for the rest of the game. When Custom finally looks to stabilize on its last turn with a Wurm’s Tooth and a pair of creatures, Fate simply pops the Augur for 3 damage and Spins into Myth one of the two blockers. At 1 life, Custom can’t stop the Shocker and recently-played Cryptic Annelid from claiming its scalp. Your 2005-07 Tinsman Division Winner! Those were some nice matches! 0 for 3. I’m falling out of contention quickly. 0 out of 3 here too. I was really rooting for Custom Creatures in the last battle. I believe “Presence of Mind” is the only core set deck to make it to the Semi-finals and was hoping to see another one get that far. Thanks, Custom Creatures. I don’t do too well in the Division Champ round. Maybe doing the semifinals as one post, and then a few days later doing the finals to make the voting a bit easier? Is this the part where I shrug and sigh, “You can’t fight Fate”? Once you look past all the gimmicky scry cards, it is quite a solid tempo deck. Great entertaining matches, as usual! Ouch. Well I completely bombed this division. You know what would be cool? A Duel Deck Championship. And assuming we get another PDS, could do a small one for that too. Totally random, but I just had to post it. The more I say that Fate Blaster is a bad deck the more it wins… I’ll have to change my strategy. Regarding the site reorganization, now that Archive Trap is gone, have you considered putting a master index to all the Precon Deck Championships somewhere on the site? In the opening section you make references to decks in the past Championships, but there’s no trackback to those matches, and the archives aren’t getting any smaller. The “Magic: The Gathering” header in the main menu also puzzles me. Isn’t every post on this site related to Magic: The Gathering? It’s there, under the Features dropdown. That said, I’ve debated whether or not to make a subcategory for each one, to make them easier to refer back to (this is what’s done for the Duel Decks on their drop-down menu). Would that make it easier to reference? The MTG header is a legacy case… when setting up the site, it was recommended that we use broad-based descriptive headers because they cross onto other blogs (someone selecting MTG articles from a tag search would pull ours and others). At this point it seems of dubious utility, and probably a needless confusion. I suspect I’d have to back out the tag assignment from all articles that I’d tagged with it to make it disappear, but something to check. I say making a subcatagory for the previous pre-con championships is a great idea. I like to go back every now and then and re-read them on occasion. Just a minor note, for anyone seeing them for the first time, since they’re all in reverse order you can kinda see what directions the tournaments go before you get to the beginning of each championships. Also while I’m here I was curious if we’ll ever be seeing reviews of the World Championship decks? I know they’re not as easy to get a hold of, but they were printed as precons and it would be kinda cool to see them get reviewed and possibly have their own tournament.